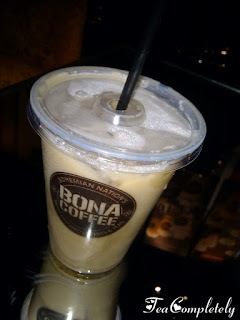 Sweetie and I found ourselves at Bona Coffee Westgate the other night. Our movie date was postponed since the movie we wanted to watch was SRO! Quickly left the mall and decided to drive around Westgate. Passed by Bona Coffee and decided to kill time there since we had a few hours before we could pick up Miguel from his prom. Since it was evening I didn't want to drink coffee. I didn't find anything close to chai latte/milk tea so I had a hard time choosing. The jolly barista seeing that I was having a hard time suggested I try out their sereni-tea drink. He described what was in it but I stopped listening when he said that it had milk in it. I immediately said yes. I was really excited to try out the drink since I've just been making my own milk tea at home the past few weeks. The color and consistency of the drink was similar to all the other milk teas I've drank but I was in for a surprise. The tea that was used in the drink was the "floral" kind. It tasted like sampaguita. I know a couple of people who like that kind of tea but I don't. I thought it was just a bit sweet so I added a bit of water, but this didn't dilute the floral taste. Anyway, I guess I'm going to stick to coffee when I'm at Bona Coffee.